Defective product. A Temash APU, IPS panel and lighter than a Vaio Tap 11. 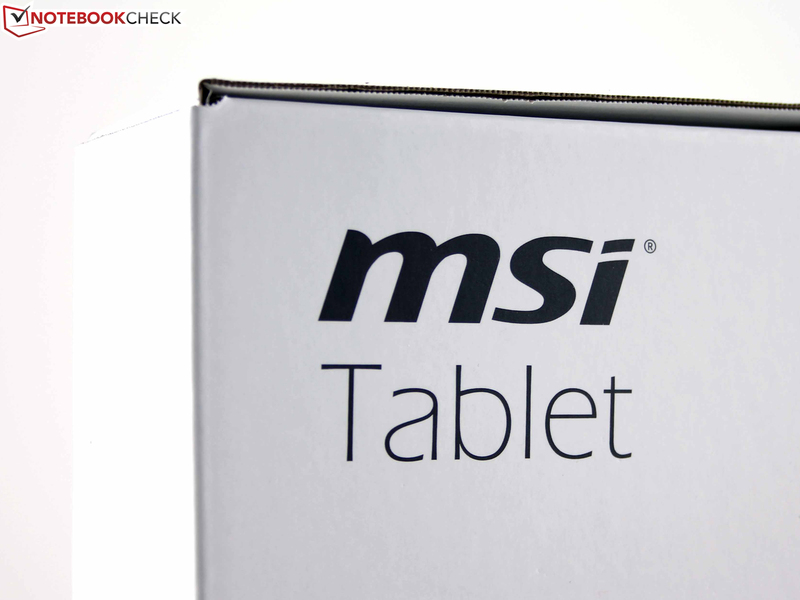 Has MSI introduced the perfect tablet to the market? MSI W20-A421 128GB: Can an AMD A4-1200 compete with Intel's Bay Trail Atom? MSI wants to score big with their new 11.6-inch Windows tablet, the W20, pointing to the fact that the device is lightweight (700 grams; 1.54 lbs), thin (10 mm) and has a strong battery life (according to the manufacturer, up to 9 hours). AMD's A4-1200 and its integrated Radeon HD 8180 are the device's technological backbone. 600 Euros (~$820) sounds a little too steep considering the tablet's hardware and IPS panel, or no? Is there something we've overlooked? 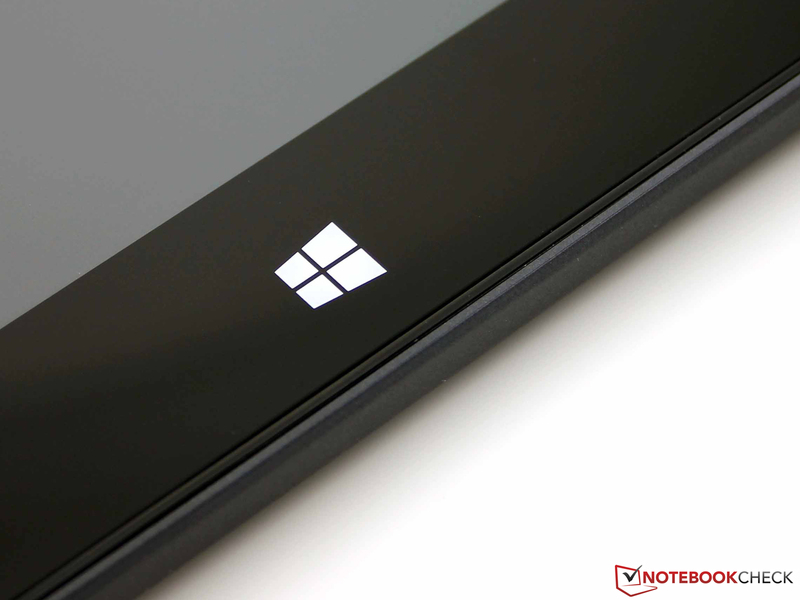 There's certainly competition in the Windows 8 tablet arena. Under 600 Euros (~$820), MSI is mainly coming up against Intel's Atom Z2760 and its Bay Trail successor, the Z3740. The Transformer Book T100TA-C1-GR (Atom Z3740) is a 10-inch device, but for 400 Euros (~$550) it represents the current Atom generation. With their new Bay Trail platform, Intel is using an offensive tactic and reduced their prices substantially. The old Atom Z2760 was and is much more expensive; Lenovo's IdeaTab Miix 10 64 GB still costs 440 Euros ($600) today, even though this new quad-core Atom completely outstrips the IdeaTab's processor. The dark case is constructed out of an aluminum plate framed with plastic on the back side and a frame on the front side. The latter only occupies the right and left sides, making it easier to grip the device there. The slits in the case where its pieces come together are thin and even enough, but we could twist the case in our hands easily. Individual pieces of plastic moved when we twisted it. The tablet's back side is stiff; it cannot be pressed inward. Connections? Who needs 'em? In order to keep down the weight and ensure immaculate manufacturing on the sides of the device, MSI got rid of ports you'll find on most tablets. Micro HDMI or Mini USB? The W20's docking port lends it access to these connections -- at least in theory. At the moment, no docking station is available for the W20. We couldn't even glean any information as to which connections the docking station is supposed to have or what it looks like. MSI doesn't install the full version of any commercial software on their hard drive. But they do equip their tablet with the annoying Norton Internet Security and Anti-Theft program, which seems to bog down the already slow APU system. MSI puts their faith in Realtek's RTL8723AE Wireless LAN 802.11n adapter. Seemingly a decent choice, as the W20's wireless reception range is shared by most notebooks: 10 meters straight across the house and through several wooden walls is no hurdle for the tablet. Nor does it struggle to connect to the router at our 15-meter mark outside the house; the tablet still has almost full bars there. Most laptops manage that in our tests as well. The wireless router (Fritz!Box 7270) transmits at 50% signal strength in this setting. Bluetooth 4.0 is also on board. 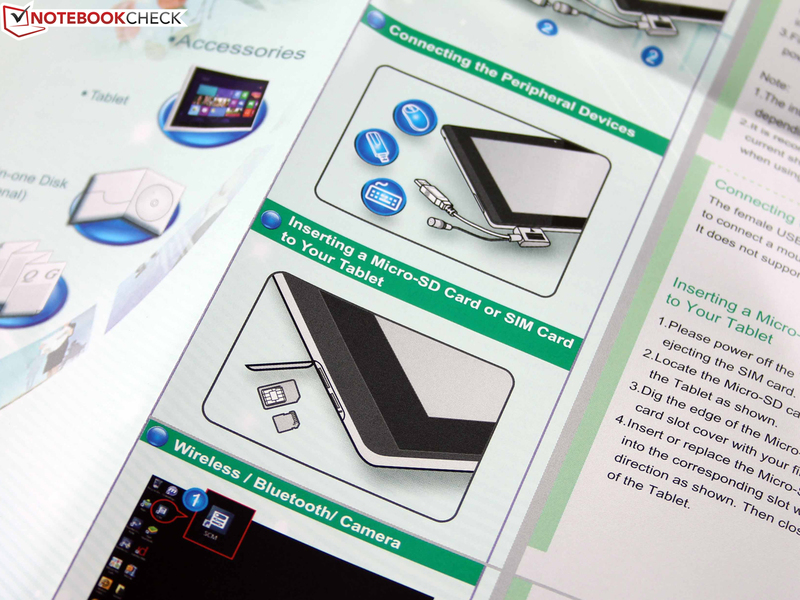 The tablet can connect to smartphones, for example, using this medium. Under a hatch next to the SD card reader, the W20 has a space for a SIM card slot, but the German version doesn't have an integrated 3G modem. That is probably part of the reason why our W20 weighs less than MSI indicates (-40 grams; -1.4 oz). 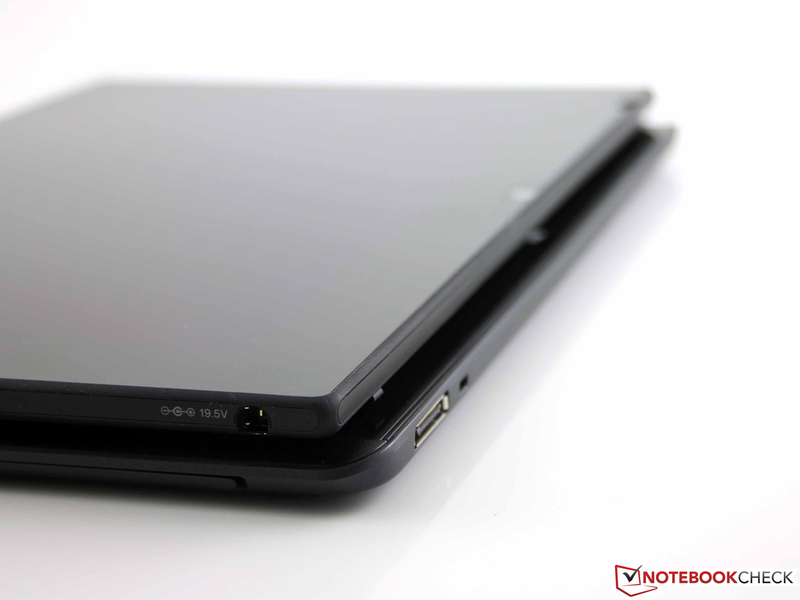 MSI markets the W20 as a business tablet. Besides the device's fingerprint reader, we found neither hardware nor software specific to the business sector. 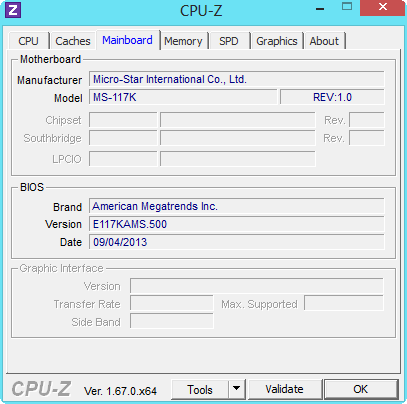 Even the BIOS contains nothing but the simple options typical of consumer models. The HD camera with a resolution of 1280x720 pixels is hardly worth mentioning. The images it captures are extremely fuzzy, poorly focused and incorrectly colored. The camera isn't even worth using for snapshots. The array microphone does its job better; recorded speech is clearly audible. Where is the docking station? 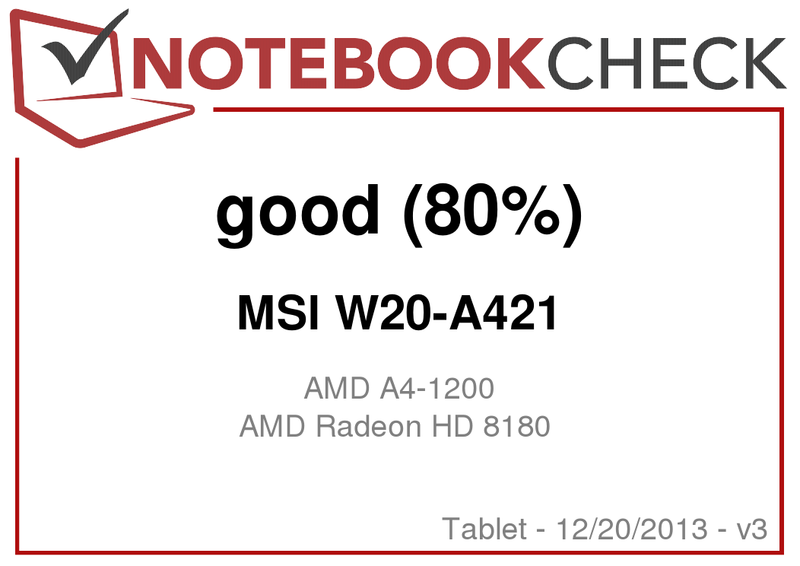 MSI hasn't really gotten off the ground with their W20. It was introduced at Computex 2013 and available in November 2013. Yet there's no information on MSI's official German website, or on any online shops, about accessories compatible with the W20. Only the manufacturer's US website has a page about the W20. MSI's press couldn't offer us any information about a docking station either. There are no access points for maintenance on the W20. Lay people will be unable to open this device. We opted not to open the case, due to the danger of damaging the tablet (we had it on loan from a shop). The battery is permanently installed. 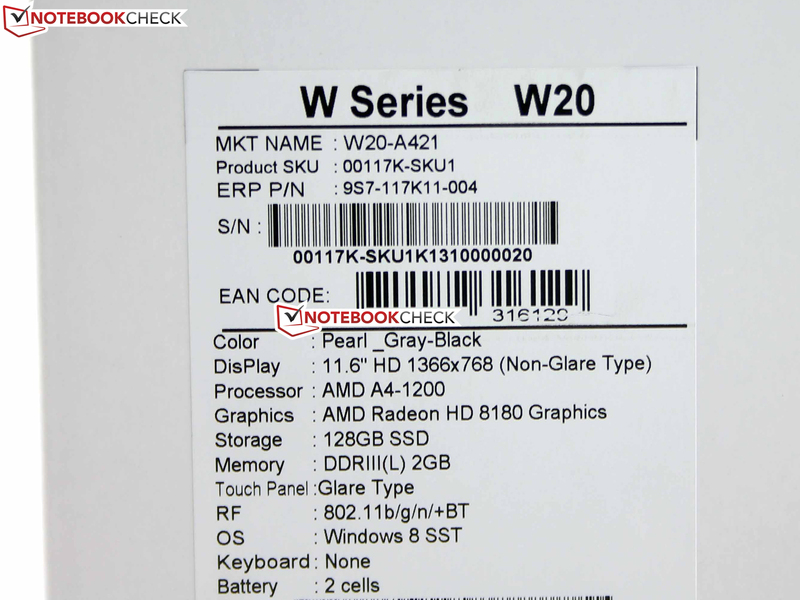 MSI offers their W20 with a 24-month manufacturer's warranty. The warranty can be extended to three years with pick-up service for an additional 99 Euros (~$135). MSI's touchscreen has 10 touch points; it recognizes input from up to 10 fingers simultaneously. The screen functions perfectly. The tablet responds to input promptly -- as long as the APU isn't otherwise engaged. The user will experience temporary delays, but the system's overall lethargy is to blame for that. The virtual keyboard corresponds to the Windows 8 standard. The W20's 11.6-inch liquid crystal touch TFT has the standard resolution for tablets in its price class, 1366x768 pixels. 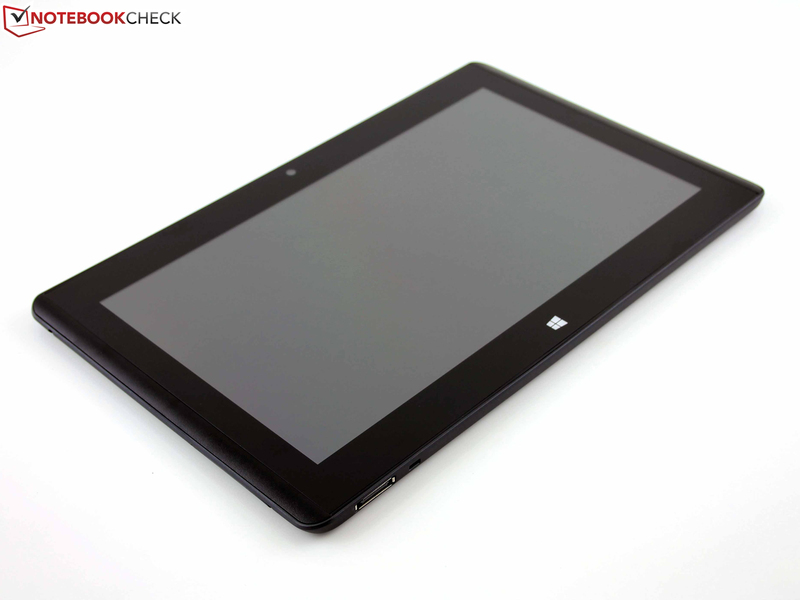 The Transformer Book T100TA-C1-GR and the IdeaTab Miix 10 both offer the same HD resolution, though both of these competing devices are equipped with 10-inch displays. Given the 11.6-inch measurement, the W20's pixel density comes to 135 dpi. 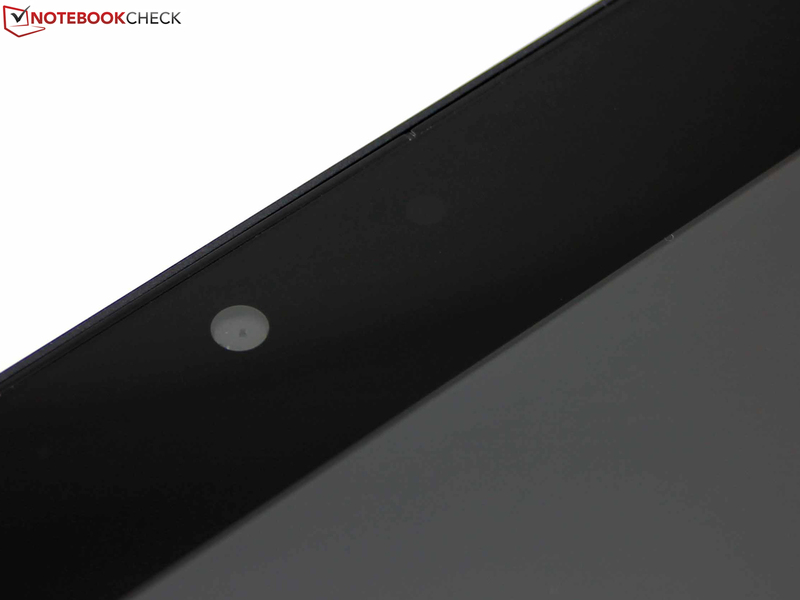 This is an IPS display, which means that it provides better viewing angle stability than a TN panel. On the plus side, the W20's brightness significantly exceeds that of the Transformer Book (by 40%), though at 444 cd/m², the IdeaTab Miix 10 glows a tiny bit brighter. At 86% similarity across the screen, the panel's brightness distribution is actually quite uniform, considering its good maximum brightness level. We didn't observe any clouding around the edges of the screen. 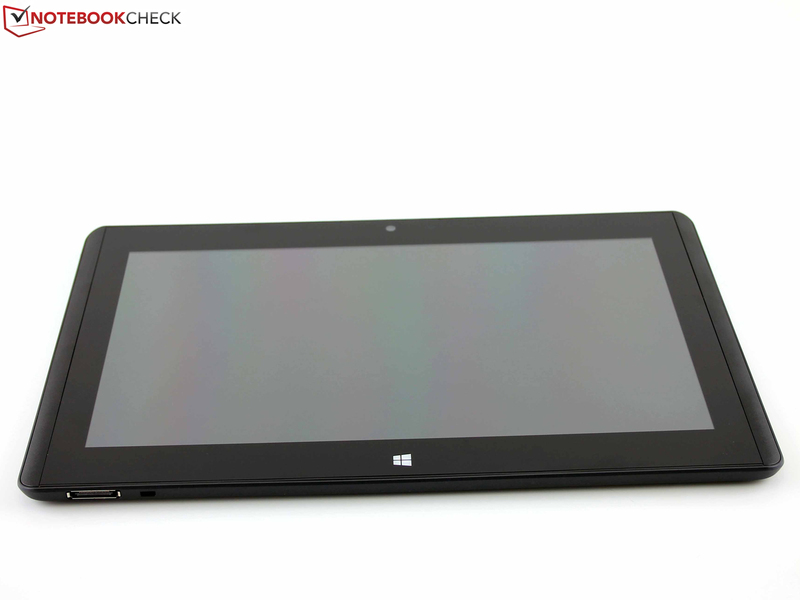 At 981:1, the W20's contrast is very high, but it can't compete with the IdeaTab Miix 10's 1480:1. 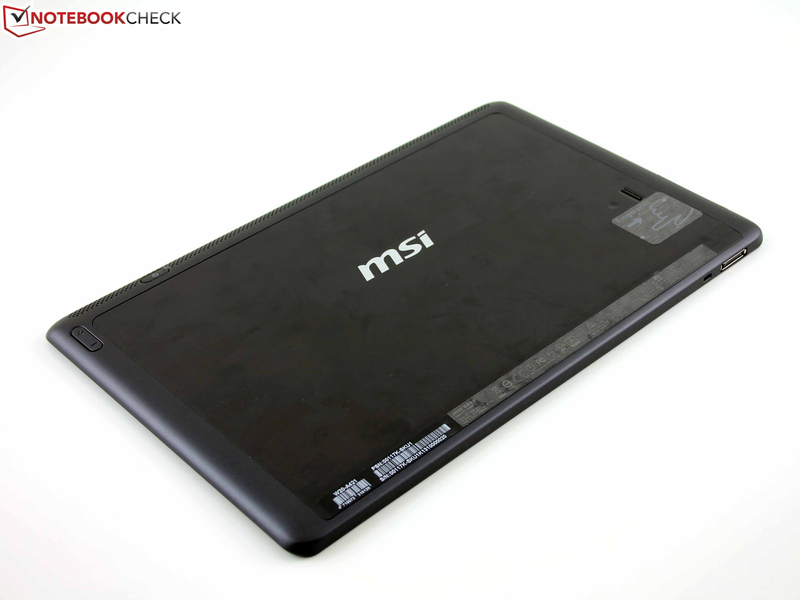 The Transformer Book's T100TA is on par with our MSI device here. In the realm of color space representation, none of the W20's immediate competitors provide an example to strive towards -- nor do any of its more distant rivals. 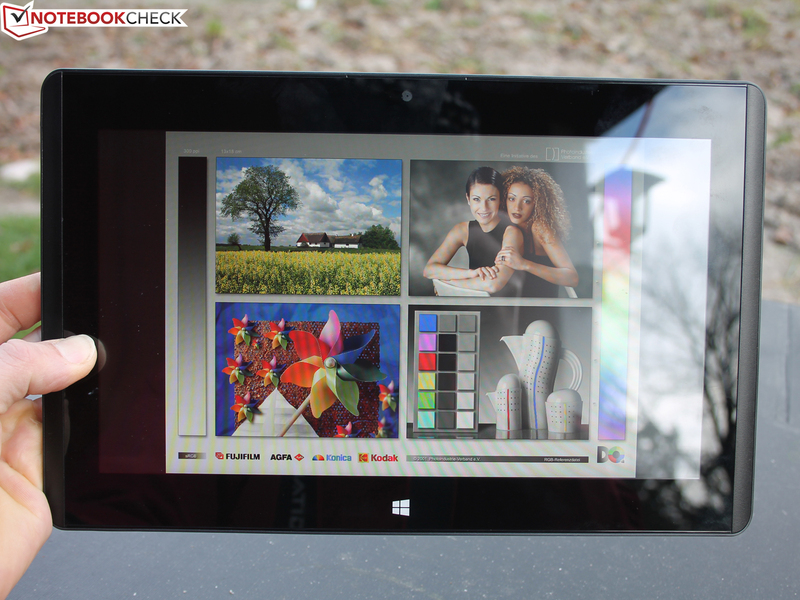 Even the expensive Surface Pro 2 only covers 40% of the AdobeRGB color space. That's a shame, because the grayscale deviations (DeltaE 3; CalMAN measurements) and color deviations (DeltaE 7) keep within reasonable limits. But the Miix 10 and Transformer Book can do that too. The Miix 10 is especially good here -- a strength that pushes the device to the top in this category. 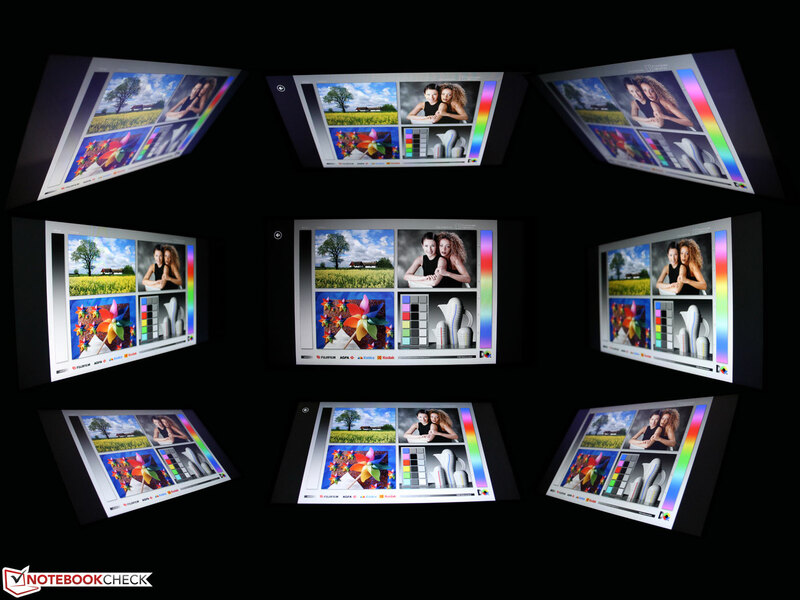 Summing up all the display criteria, the Miix 10 proves to have the best panel. Even the Surface Pro 2 falls behind it in this discipline. At an average of 397 cd/m², the panel's brightness is very good and sufficient for outdoor use. The following photos were taken under heavy cloud coverage, which worked to the W20's advantage. 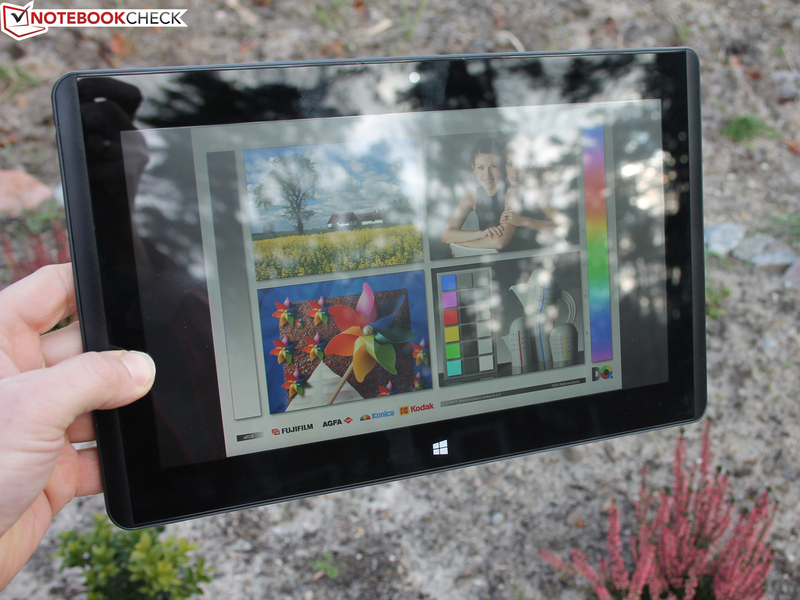 The screen's reflective surface makes working outdoors more difficult, as with any tablet. In battery mode, the screen brightness stays constant, as long as the ambient light sensor is deactivated or the environment is bright enough to hold it at its maximum level. However, in reality the former isn't an option, as the corresponding Windows setting (energy settings) doesn't do anything. The active sensor reduced the screen brightness for our outdoor photos, but in full sunshine the panel should glow at maximum power. On a cloudy day: The screen is still reflective. The ambient light sensor decreases the brightness. The crisp colors are noticeable outside, too. One of the advantages of In-Plane Switching (IPS) technology is wide viewing angles along both the vertical and the horizontal axis. Our review device's IPS panel is no exception here. Even if you're viewing the screen from a much less than ideal angle, you still won't experience any color inversions. As a result, you can change your viewing angle without having to readjust the screen. "...not enough RAM" - and the program crashes. To be honest, we've rarely been as aggravated by a Windows tablet as we were by the W20. AMD's A4-1200 (1 GHz) is no high-performance processor; after all, it was created to compete with Intel's first Atom generation for tablets. We already knew software wouldn't install lickety-split, programs would take their sweet time to load, and benchmarks would run forever before finally reporting low scores. That was true of netbooks with these processors as well (both Intel and AMD). In the W20's case, however, program start-ups took up to 60 seconds (PCMark 8), some didn't run at all (3DMark 11, Anno 2070, Crysis 1), and some died the slow death of a perpetually black screen (Diablo 3). On top of all that, in the middle of testing we experienced memory errors (see screenshot, 3DMark 2013) and two serious crashes due to graphics errors (during 3DMark) forcing us to restart. The APU is complemented by a 128 GB storage drive in the form of a Kingston mSATA SSD. 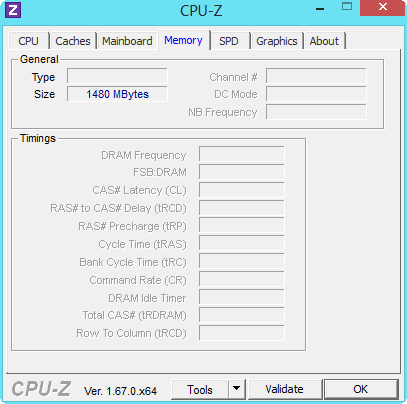 Why MSI installed only 2 GB of DDR3 RAM on the board is a mystery to us; the APU itself is able to support more. The manufacturer still chose to install Window 8.1 64-bit. MSI equips the W20 with an A4-1200 APU from AMD. 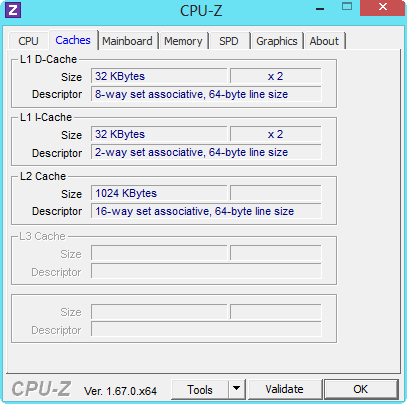 The CPU portion of the APU is a dual-core processor with a speed of 1 GHz. There is no turbo. This model consumes very little energy; AMD estimates the TDP at 3.9 Watts. Our subjective impression that the APU wasn't running smoothly was verified by the tablet's exceptionally weak benchmark results. In the Medion Akoya E1317T, the same APU ran 46% and 109% faster (Cinebench R11.5 Multi/Single 64-bit)! Because the W20's APU can be easily compared with the Bay Trail Atom, we inserted the following table with the 32-bit values from the older Cinebench R10. The other devices do considerably better, especially with the new Atom Z3740 (+209%). Here, too, the Akoya E1317 surpasses our review device (+75%). 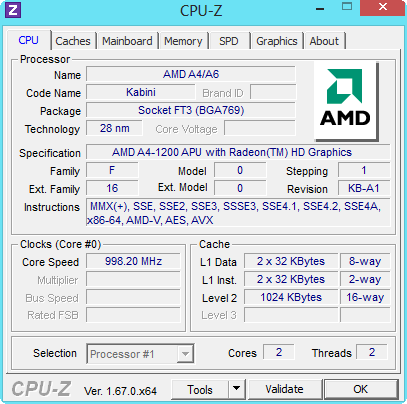 One look at the processors' clock frequencies reveals the cause: The APU's two cores run at a constant 600 MHz (rather than 1000 MHz); consequently Windows fixes the load at a maximum of 59%. 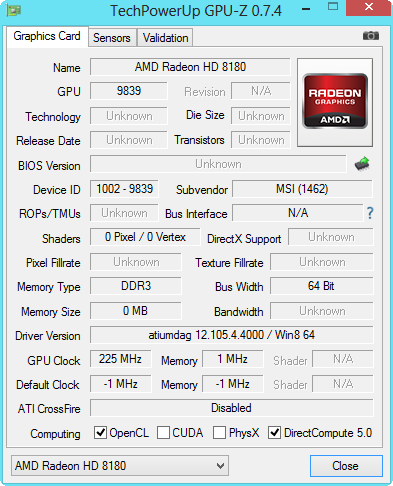 In the Windows settings and AMD driver the performance is listed at 100%. Here MSI cuts the clock frequency. In battery mode the scores are identically low. The consequences for application performance are disastrous. First we have PCMark's testimony: With the same APU, the Medion Akoya E1317T (HDD) accumulates 17% more points; the PCMark 7 computation score is especially striking here (+28%). The old Atom generation comes in 56% ahead -- and Bay Trail 151%. The Asus Transformer Book T100TA's computation score is 161% higher. When does a user need to beware? An example: While we're working on the tablet, we copy data from an external HDD on to our internal storage drive. The result: Switching between program windows takes 2-3 seconds, text input appears on the screen only after a noticeable delay, websites load bit by bit (this can easily take 10 seconds), and the system just plain doesn't react to some touch and mouse inputs. 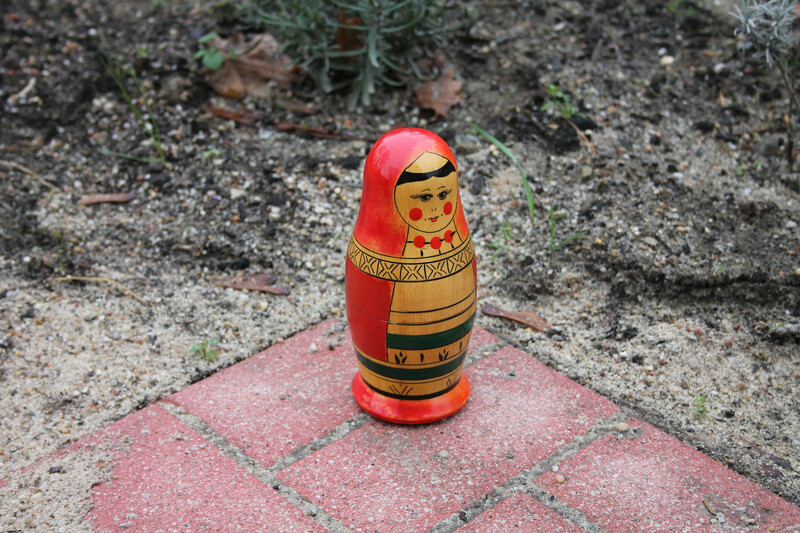 We wrestled hardest with the Windows 8 updates (automatic). With a reboot, some passes took two to three hours to complete. We've never once experienced such a massive hindrance to productivity with a netbook. The SSD (a Kingston SMSM150S3128G) has a gross capacity of 128 GB and is installed as an mSATA module. 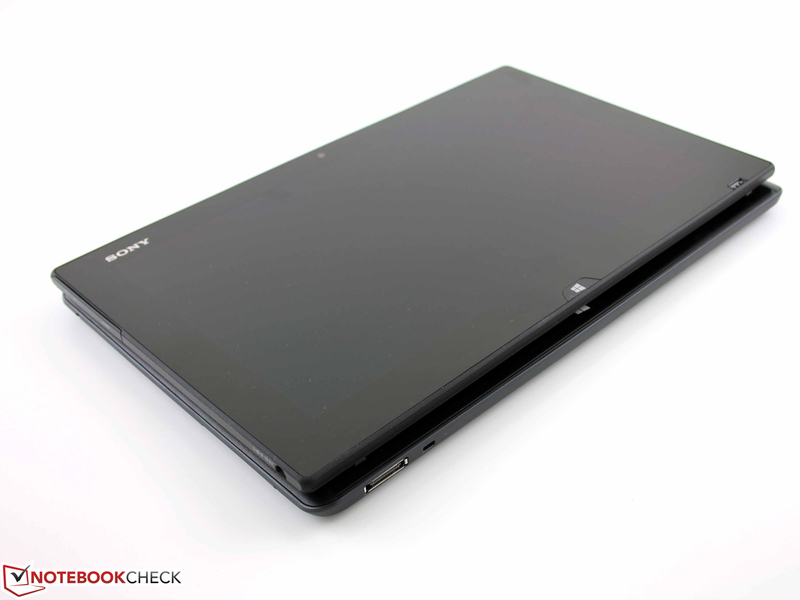 Its results are surprisingly good, even compared with the Vaio Tap 11's high-end SSD. For once, the Transformer Book and the IdeaTab Miix 10 can't keep up here. The high sequential read rates are especially striking, but the read/write 4k rates are good too. PCMark 7 honors this achievement with a strong system storage score (the Vaio Tap 11's score is only 6% higher). But none of this really benefits the user, as our subjective experience with the system's performance and the system benchmarks show. A Radeon HD 8180 is responsible for graphics output. It runs at a speed of 225 MHz and supports DirectX 11.1. As was true in the Cinebench benchmarks, the W20 can't keep up with the competition -- once again, it can't even hold its own compared to the Medion Akoya E1317T (A4-1200, HD 8180), equipped with the same CPU and GPU. But the Radeon is inferior to the HD Graphics (Bay Trail) in other devices too. 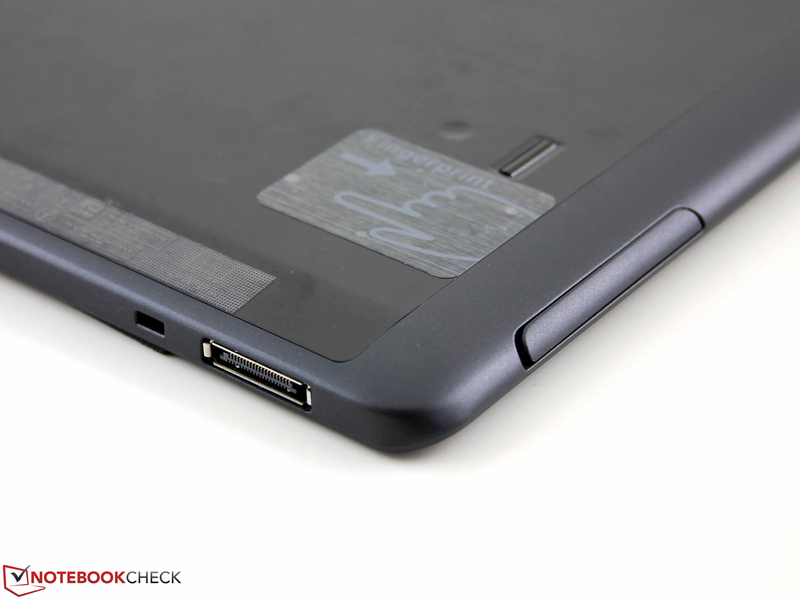 The Transformer Book T100TA takes the lead with a 75% higher score. The first Atom generation fails to make up for lost ground, though we only see the 32-bit shading value here. Gaming just isn't going to happen on the MSI tablet. Just the installation process takes an eternity, and some older titles wouldn't even start. The old Risen ran 151% faster on the Bay Trail Atom, but even then, 23 fps isn't enough to play the game fluidly. The MSI W20 has no fan and therefore runs in complete silence. This is essentially standard for the A4-1200 and also the case with the Toshiba Satellite W30Dt-A-100. In idle mode, but also during normal web-surfing or other tasks demanding little performance power, on average the MSI W20 doesn't grow warmer than 30 °C (86 °F). The temperature is very even across both the top and bottom sides of the device. The passively cooled tablet maintains relatively low surface temperatures under constant load (stress test). There are only a few hot spots, measuring up to 46 °C (114.8 °F) on the front side and 39°C (102.2 °F) on the back, neither of which are extremely high temperatures. Also, the stress test is rather an unrealistic scenario, especially for a low-performance tablet like the MSI W20. The Lenovo IdeaTab Miix 10 with its older Atom processor grows a little warmer on average, but its temperatures remain at a similar 42 to 43 °C (107.6 to 109.4 °F). Bay Trail also does its job quite well, even with its four cores. We measured maximum temperatures of 43 °C (109.4 °F) and 45 °C (113 °F) at specific locations on the passively cooled 10-inch Asus device. The APU generates such little heat because, as we saw with the individual benchmarks, it runs at 600 MHz instead of 1000. It works at this speed constantly, both after one hour in the stress test and when Prime 95 (Multi) runs alone. We couldn't get a reading on the GPU clock rate, as expected. (±) The average temperature for the upper side under maximal load is 33.2 °C / 92 F, compared to the average of 30.7 °C / 87 F for the devices in the class Tablet. (-) The maximum temperature on the upper side is 45.9 °C / 115 F, compared to the average of 34.8 °C / 95 F, ranging from 22.2 to 51.8 °C for the class Tablet. (+) In idle usage, the average temperature for the upper side is 29.8 °C / 86 F, compared to the device average of 30.7 °C / 87 F.
The speakers are located under tiny openings on the upper back side of the tablet, and the speakers are sized to match these tiny openings in the flat case. Despite their lack of volume, the speakers manage to overemphasize high tones while neglecting mid and bass tones. 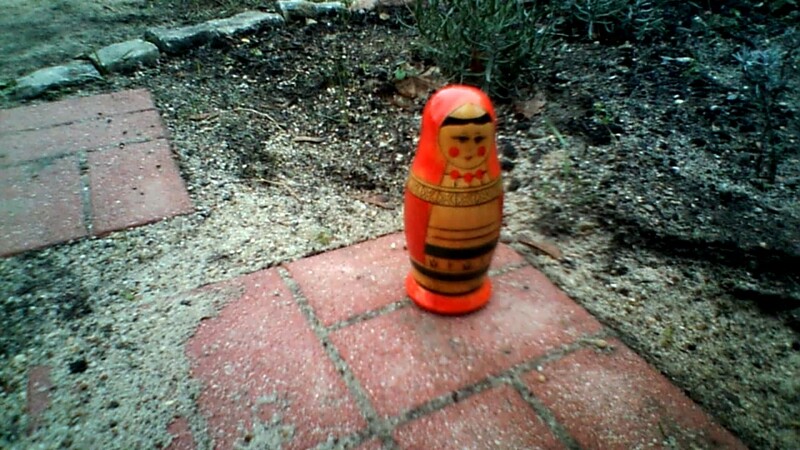 At high volume, the little speakers crackle audibly, and the high pitch almost hurts your ears. External speakers or headphones can be connected via the audio jack; for music lovers, there can be no other option. In idle mode, we measured a relatively low energy consumption rate of 4.9 Watts on the mains side. But the Clover Trail processor's rate was lower (IdeaTab Miix 10, 1.8 Watts) and the Bay Trail's rate was even lower than that (Transformer Book, 1.7 Watts). Things look different in the stress test: At an energy consumption rate of 14.2 Watts, the MSI tablet is just plain wasteful. Because of its four cores, under this level of load the Bay Trail Asus needs considerably more energy than the Lenovo device with its Clover Trail Atom (8.7 vs. 11.8 Watts). Looking at the numbers, we can clearly see: The Intel systems manage a higher level of performance per Watt than the AMD APUs. If long battery life is what MSI was going for this whole time with the APU's 600 MHz clock frequency, the manufacturer can enjoy some success here. Our test device's competitors, the Miix 10 (WLAN -28%, 5:29 hours) and the Transformer Book T100TA (WLAN +41%, 10:47 hours), hem the W20 in behind and before. In our WLAN test, a script loads a new website in the browser every 40 seconds, including some video content. The Transformer Book proves to have a longer battery life, even though it has a somewhat smaller battery capacity (30 Wh). The W20's battery has 34 Wh. MSI, it won't work. The manufacturer was too late in bringing their W20 to the market. The A4-1200 should have competed with the Cloverview Atom, which until recently would have been a good match in terms of price as well. Now Intel's quad-core Bay Trail Atom is showing up in tablets for the first time. This new generation isn't just faster; it's cheaper too. The new Atom tablets are available starting at 400 Euros ($550). The W20 with its sluggard A4-1200 (800 instead of 1000 MHz) just can't keep up with the new Bay Trail processors. 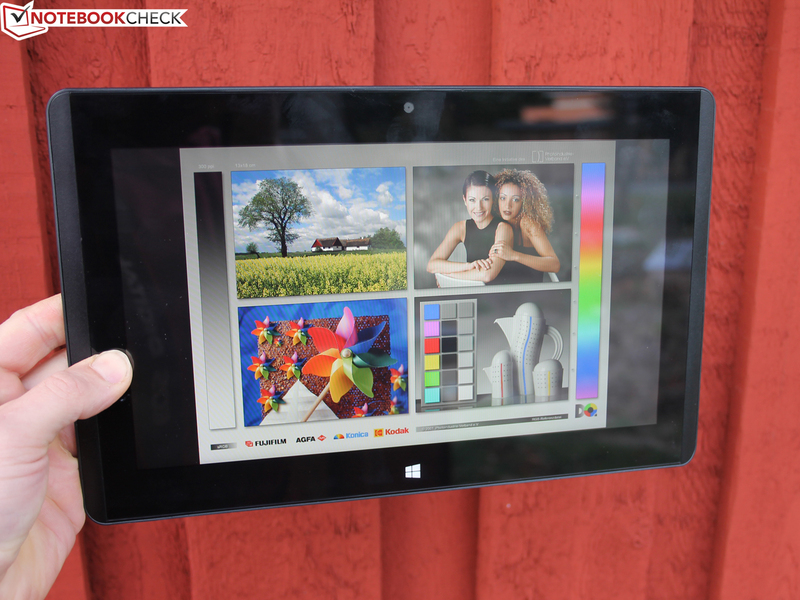 Benchmarks aside, we were appalled by how lethargic a Windows 8 tablet can feel. We never experienced such a weak performance even with Cloverview dual-core processors. The severe system crashes (though not reproducible) point to a hardware defect. 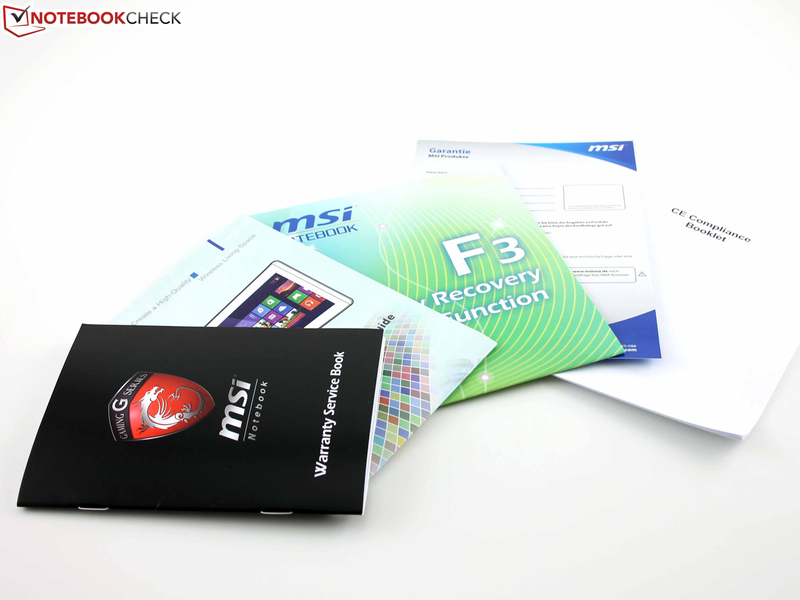 We requested a second test device from MSI in order to assess another sample. In order to keep the device's weight under 700 grams (1.54 lbs), MSI installs a battery with a capacity of just 34 Wh. Still, the battery's runtimes are strong: It lasted a good seven hours in our WLAN test. In our opinion, the W20's strengths aren't enough to make up for its weaknesses: Neither the very bright, high-contrast IPS panel nor the device's low temperatures can take the focus off of our review device's problems. We cannot recommend the W20 for purchase. Firstly, it's too slow, and secondly, it's too expensive. If you buy this 11.6-inch tablet expecting to have a good, easy experience with a familiar operating system, you'll soon be disappointed by the system's lethargic behavior and pine after your old Pentium notebook. Those click-clacking hard drives at least made noise when they were going to make you wait. 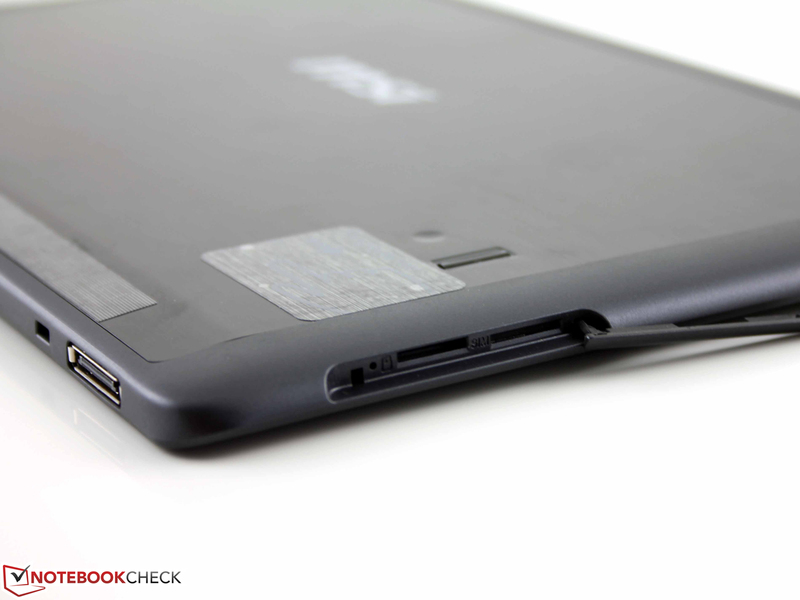 Of the two competitors, we can only recommend the Asus Transformer Book T100TA-C1-GR. With its Bay Trail Atom processor, the Asus tablet's performance is substantially stronger, it has a docking keyboard, it runs longer and only costs 400 Euros to boot (~$550). You'll also get a good IPS panel and a full version of Office Home & Student. Except for the small amount of SSD storage space (32 GB; versions with more storage are available), we have nothing to complain about. If you're looking for more performance than APU or Atom systems have to offer and are willing to sacrifice battery life, we recommend you take a look at Acer's Aspire P3-171-3322Y2G06as (Core i3-3229Y). The cheapest version with a Core i3 processor has an 11.6-inch display and comes with a keyboard case, starting at 550 Euros (~$760). 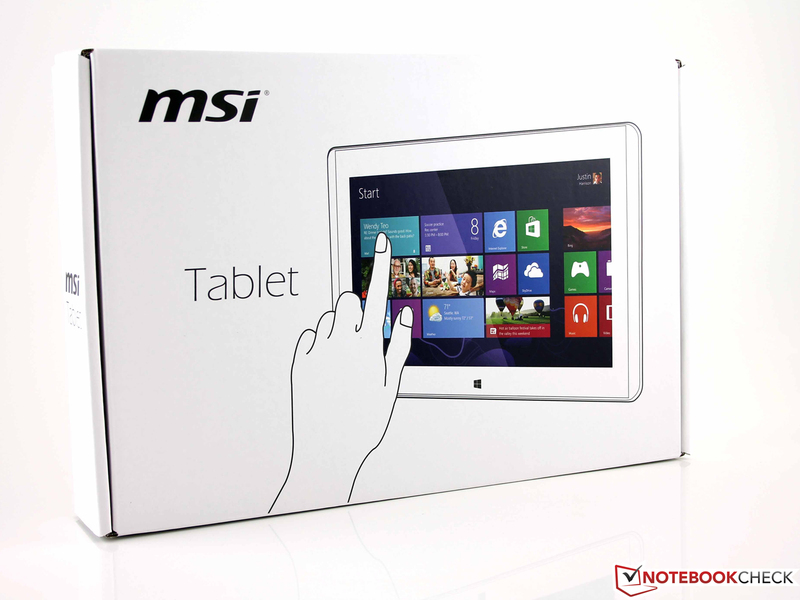 MSI W20-A421 128GB - certainly not the first 11.6-inch Windows 8 tablet. It is the only tablet smaller than 12-inches with AMD's A4-1200 APU. Besides that there is only the Satellite W30Dt-A-100 (13-inches) with the same APU, but the Satellite has a conventional hard drive. The manufacturer built a very light case: 674 grams is very lightweight for a tablet of this size. MSI does a good job with its display. It only has a resolution of 1366x768 pixels, but it displays the Metro UI with very good viewing angles and high contrast. 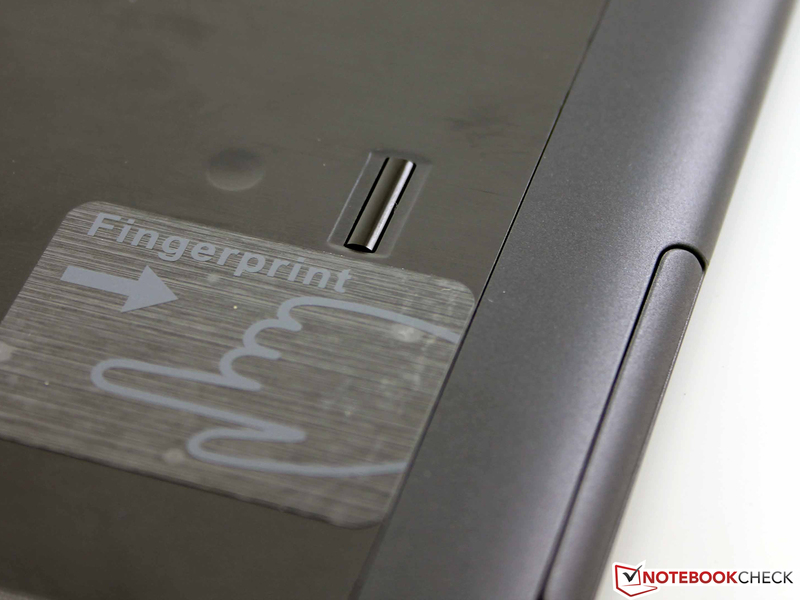 and one fingerprint reader (back side). Besides those, you won't find any other connections on the W20. A size comparison with the Vaio Tap 11. ...but at 762 grams, it weighs almost 100 grams more. We should explain, though: Sony uses that weight to install a Micro SD slot and SIM card slot. The power and volume buttons are located on the back of the device. 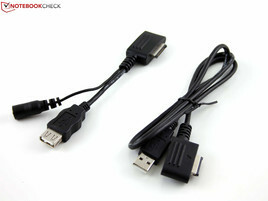 The dongle connects to the DockingPort. 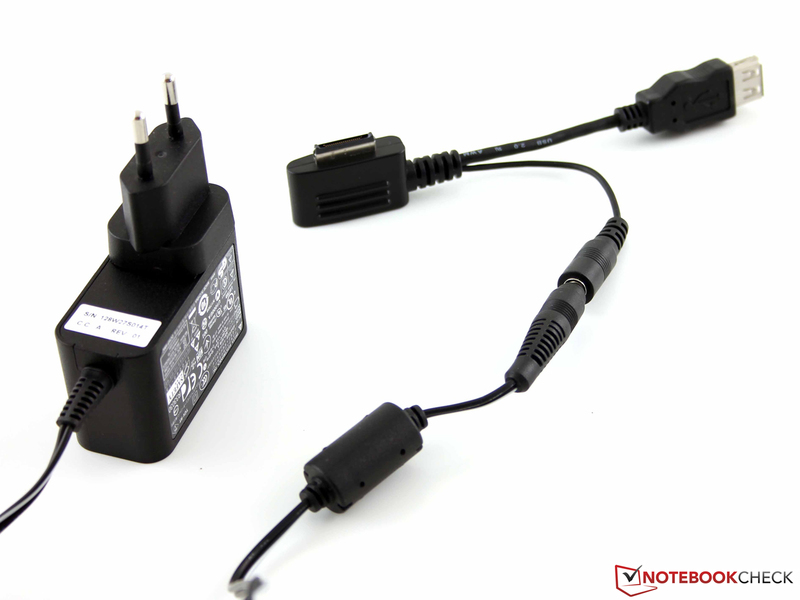 The power supply or a USB device connect to the tablet through the dongle. 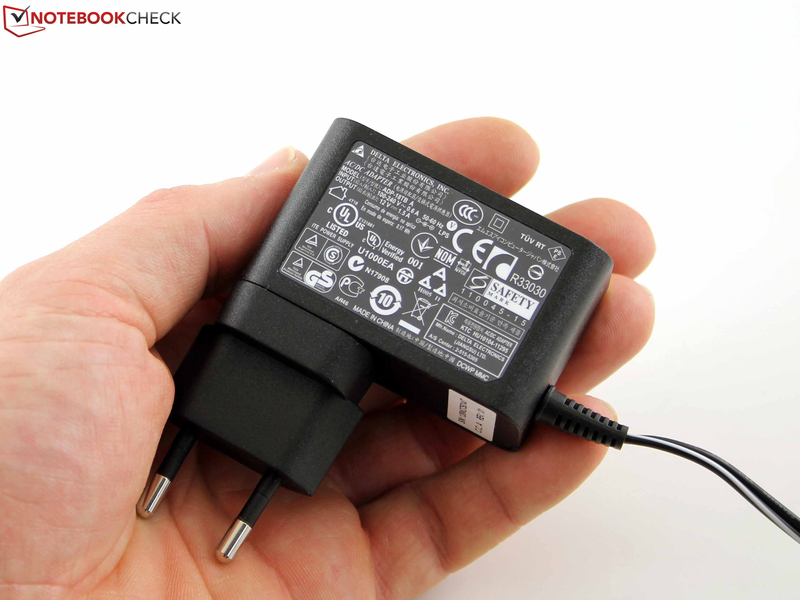 The power supply weighs just 138 grams and delivers 18 Watts of power. MSI W20-A421 128 GB: A very good HD IPS panel. MSI W20-A421 128GB: There is a SIM card slot, but the German version does not have a 3G modem. MSI W20-A421 128 GB: Connecting the power supply via the dongle? This solution seems a little disconcerting. The vivid colors and bright display. How much MSI left out, and yet they're not selling a compatible docking station. The seemingly makeshift dongle is just odd. We've seen the A4-1200 work more quickly: What the APU has to offer just doesn't meet the requirements for a Windows 8 tablet.